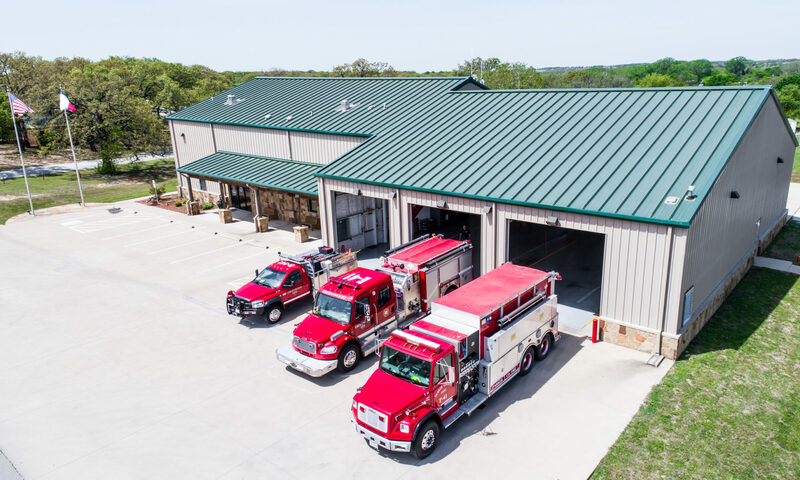 COMMITTED TO EXCELLENCE IN EMERGENCY SERVICES"
PRIOR TO 1966, THE WEATHERFORD FIRE DEPARTMENT PROVIDED FIRE AND RESCUE SERVICE TO THE CITIZENS OF GREENWOOD AND SURROUNDING AREAS. FOR THIS SERVICE, PARKER COUNTY PRECINCT 3 PAID A NOMINAL FEE TO THE CITY OF WEATHERFORD. LATE IN 1965, THE CITY OF WEATHERFORD PROPOSED A SIGNIFICANT COST INCREASE FOR THIS SERVICE IN THE AMOUNT OF $10,000 ANNUALLY. PRECINCT 3’S COMMISSIONER AT THE TIME THOUGHT THAT THE INCREASE WAS NOT JUSTIFIED AND DECIDED TO EVALUATE WHETHER THE CITIZENS OF THE AREA WOULD BE INTERESTED IN FORMING A VOLUNTEER FIRE DEPARTMENT TO AVOID A SERVICE FEE ALTOGETHER. SO, EARLY IN 1966 AT THE URGING OF THE COMMISSIONER, THE INITIAL MEETING OF POTENTIAL FIREFIGHTERS WAS HELD. IN ATTENDANCE WERE: D.L. ENGEL, S.L. MOSS, HERBERT WALKER, TERRY YOUNG, GENE LIGHT, DALE ROMER, J.W. YOUNG, HARVEY LIGHT, FRED TUCKER AND KENNITH YOUNG. THE DECISION WAS MADE TO PROCEED AND THE ADVENTUROUS BAND OF FIREFIGHTERS, NONE WITH FIREFIGHTING EXPERIENCE, SET FORTH ON A MISSION THAT HAS LASTED FOR OVER FORTY FIVE YEARS. THEY ELECTED OFFICERS AND GREENWOOD VFD’S FIRST CHIEF WAS KENNITH YOUNG. KENNITH’S LEGACY CONTINUES AT GREENWOOD TODAY. HIS SON, J.W. YOUNG, WAS A MEMBER UNTIL HIS DEATH IN 2007 AND KENNITH’S GRANDSON, JOHN YOUNG, IS AN ACTIVE MEMBER OF THE DEPARTMENT. PARKER COUNTY PRECINCT 3 GAVE THE GROUP A FEW HUNDRED DOLLARS TO GET STARTED AND THEY USED THE MONEY TO BUY FIVE GOVERNMENT SURPLUS TRUCKS FROM CARSWELL AIR FORCE BASE. AT THAT POINT, THEY HAVE NO FIRE STATION TO HOUSE THE EQUIPMENT, SO THEY CONVINCED A LOCAL BUSINESSMAN TO LET THEM HOUSE THE TRUCKS AT HIS SERVICE STATION NEAR THE CORNER OF JONES ROAD AND RANGER HIGHWAY. 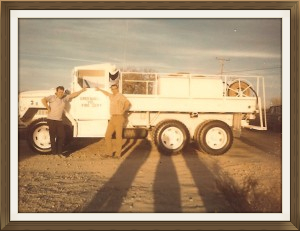 THE NEWLY FORMED DEPARTMENT THEN FOCUSED ON TWO TASKS – TRAINING THE RECRUITS IN THE SCIENCE OF FIREFIGHTING AND TRANSFORMING THE SURPLUS TRUCKS INTO FIREFIGHTING VEHICLES. THE GREENWOOD DEPARTMENT HAS CERTAINLY COME A LONG WAY! DURING THE INTERVENING YEARS, THE GREENWOOD FIRE DEPARTMENT HAS BEEN INVOLVED IN HUNDRED OF FIRES AND HAS SAVED MUCH PROPERTY AND SOME LIVES AS WELL. IN 2006 THE DEPARTMENT STARTED RUNNING EMS CALLS AND IN 2009 BECAME A STATE CERTIFIED FIRST- RESPONDER ORGANIZATION. EMERGENCY MEDICAL SERVICE HAS BECOME OUR LARGEST AREA OF GROWTH. TODAY THE DEPARTMENT IS A THRIVING ORGANIZATION WITH ABOUT FORTY THREE MEMBERS, NINETEEN ACTIVE VOLUNTEER FIREFIGHTERS AND NINE AUXILIARY MEMBERS. THE GROWING NUMBER OF STRUCTURE FIRES AND TOTAL CALLS IS AN INDICATION OF THE GROWTH OF THE GREENWOOD AREA. PARKER COUNTY IS ONE OF THE FASTEST GROWING COUNTIES IN TEXAS AND OUR DISTRICT HAS SHARED IN THAT GROWTH. CURRENTLY WE HAVE APPROXIMATELY TWENTY FIREFIGHTERS AND EIGHT AUXILIARY MEMBERS WHO PROVIDE SUPPORT FOR THE DEPARTMENT. WE HAVE AN AGGRESSIVE TRAINING PROGRAM AIMED AT CERTIFYING ALL DEPARTMENT MEMBERS WITHIN THEIR FIRST THREE YEARS OF MEMBERSHIP. THE DEPARTMENT HAS BEEN VERY FORTUNATE OVER THE PAST FEW YEARS IN WINNING GRANTS, WHICH HAVE ALLOWED US TO ACQUIRE MANY NEW PIECES OF FIREFIGHTING EQUIPMENT INCLUDING THREE NEW APPARATUS, SCBAS, BUNKER GEAR, A NEW RESCUE TOOL (JAWS OF LIFE), TWO THERMAL IMAGING CAMERAS AND TECHNICAL RESCUE EQUIPMENT. OUR STATION WAS BUILT BY HAND BY OUR MEMBERS IN 1972. IN THE 1990S A THIRD BAY WAS ADDED. IN 2001, A FOURTH BAY WAS ADDED AND IN 2004-05, THE STATION WAS DOUBLED IN SIZE AND A KITCHEN/DAY AREA AND BATH WERE ADDED. WITH THE PASSAGE OF EMERGENCY SERVICES DISTRICT 7 IN NOVEMBER OF 2009, THE DEPARTMENT HAS THE FINANCIAL STABILITY TO ADDRESS SIGNIFICANT CHALLENGES FOR THE FUTURE. 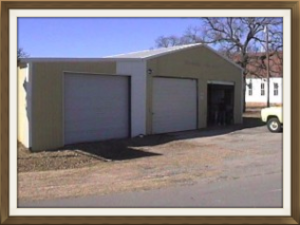 WE OPENED OUR NEW ESD 7 STATION NEXT TO OUR OLD STATION IN 2012. IT IS LARGER AND INCLUDES AN AREA FOR LIVING QUARTERS, KITCHEN, OFFICE SPACE, STORAGE AREAS, AND A LARGE MULTIPURPOSE COMMUNITY ROOM THAT CAN BE RENTED AND USED FOR TRAINING AND MEETINGS. THE NEW STATION HAS ROOM FOR UP TO SIX FULL SIZED APPARATUS AND IS STAFFED MONDAY THROUGH FRIDAY FROM 8 AM TO 6 PM WITH PAID FIREFIGHTERS. THE NEW STATION IS AN IMPORTANT PART OF THE GREENWOOD COMMUNITY AND WILL CONTINUE TO PROVIDE QUALITY EMERGENCY SERVICES TO OUR CITIZENS. ESD 7 HAS GROWN WITH THE ADDITION OF THE MILLSAP FIRE DEPARTMENT AND THE COOL-GARNER FIRE DEPARTMENT WHEN THE RESIDENTS FROM THOSE AREAS VOTED TO JOIN ESD 7. RECENTLY THE RESIDENTS IN THE EXTRATERRITORIAL AREA WEST OF WEATHERFORD HAVE ALSO JOINED ESD 7. WE HAVE WORKED TOGETHER AS MUTUAL AID PARTNERS FOR YEARS WITH THESE AREAS AND IT IS GREAT TO HAVE THEM AS PART OF ESD 7. GROWTH IN THE ESD ALLOWS MORE RESOURCES TO COVER THE EVER INCREASING COST OF PROVIDING THE EMERGENCY SERVICES. WE ARE NOW TRAINING TOGETHER AND WILL CONTINUE TO DEVELOP AND INCREASE OUR JOINT PARTICIPATION TO BETTER SERVE THE RESIDENTS OF ESD 7. IN OUR NEW STATION WE HAVE CREATED A WALL TO HONOR PAST MEMBERS AND THEIR SIGNIFICANT CONTRIBUTIONS TO THE GREENWOOD RURAL VFD. WE HAVE A LARGE WOODEN BANNER DONATED BY ONE OF OUR RESIDENTS ALONG WITH A PHOTO AND PLAQUE OF THE HONORED MEMBER AND THEIR STORY. THE WALL IS LOCATED IN THE COMMUNITY/TRAINING ROOM. THE FIRST MEMBER ADDED TO THE WALL OF HONOR WAS KENNITH YOUNG WHO SERVED FROM 1966 TO 1993 AND IS ONE OF THE ORIGINAL FOUNDERS OF THE DEPARTMENT. NEXT WAS J.W. YOUNG WHO SERVED FROM 1966 TO 2010, SON OF KENNITH AND THE LONGEST SERVING MEMBER OF THE DEPARTMENT THUS FAR. THE YOUNG FAMILY CONTRIBUTIONS CONTINUE TODAY WITH KENNITH’S GRANDSON AND J.W.’S SON, JOHN YOUNG, AND HIS WIFE, ANGIE WHO IS OUR AUXILIARY PRESIDENT. ANOTHER MEMBER SO HONORED IS WILLIE LANGFORD , A FORMER CHIEF AND IMPORTANT PAST MEMBER OF THE DEPARTMENT. THE LAST MEMBER ADDED TO THE WALL OF HONOR IS JEFF BERGT WHO SERVED FROM 2002 TO 2011. JEFF’S WIFE, CHERIE, CONTINUES HIS LEGACY AND FUNCTIONS AS OUR TREASURER. ALL OF THESE HONOREES SERVED THE GREENWOOD COMMUNITY WITH HONOR AND DIGNITY AND ARE MOST DESERVING OF THIS HONOR. A SATELLITE STATION IS SOMETHING THE FUTURE HOLDS. THE SATELLITE STATION WOULD BE LOCATED IN THE NORTHWEST QUADRANT OF OUR FIRE DISTRICT TO PROVIDE FASTER RESPONSE TIMES TO CITIZENS THERE. THIS MAY BE DONE IN CONJUNCTION WITH NEIGHBORING DEPARTMENTS. THE FUTURE OF THE GREENWOOD RURAL VFD IS BRIGHT AND FULL OF PROMISE. WE ARE COMMITTED TO CONSTANTLY IMPROVING OUR SKILLS AND ABILITIES AND WE ARE DEDICATED TO PROVIDING THE BEST POSSIBLE SERVICE TO THE COMMUNITY WE ARE PRIVILEGED TO SERVE.